CAN YOU BE ALL THINGS TO ALL CUSTOMERS? Before the meeting about our new website even starts, Jason is fuming mad. He sits down at the conference room table and folds his arms, glaring at me as his jaw flexes. He skips the pleasantries and gets to the point. I thought that the headline was creative and effective. But at this point, I have two choices. Fight for my point of view. Or find common ground. I’ve experienced countless meetings like this one with Jason. Two sides fighting for different expressions of the brand. One creative. One direct and straightforward. Early in my career as a creative writer, I was taught by my creative directors to always fight for your ideas. Push back on the product marketers. The strategists. The client. The only way a creative idea would survive is if you never gave up. While I have as much tenacity as the next person, I never believed that marketing should be a warzone. And because I appreciate both sides, the creative and strategic aspects of marketing, I never felt good about digging in my heels and being a jerk about the process of idea creation. I also knew that there had to be a way to take the focus off of the two warring sides and find a solution that brought the best of strategy and creativity together. In marketing, creativity and strategy can live in harmony. Certainly there is the challenge of getting buy in from both sides. If you suggest compromise to the creative department, they consider you a sellout hack. If you suggest compromise to the strategists and marketing managers, they treat you as a less educated marketer who doesn’t understand metrics. Fortunately, after years of experience and thanks to dozens of books and studies, I found a solution that has worked remarkably well. Just because it sounds right, doesn’t mean that it’s right. Before we discuss my solution, we must first understand what a brand’s voice and tone really mean. Because so many people get it completely wrong. Right now I’m experiencing the equivalent of fingernails on a chalk board. Let me break down why statements like this are just wrong. The voice of a brand is the character. The personality. A summary of values. It should never change. The tone of a brand is the mood that the personality expresses at a specific moment in time. It changes constantly, just like our moods change. The tone and voice are not the same thing for a brand. They are two distinct elements. The voice is who we are. Our character may have depth, flaws, and strengths—but it represents what we stand for. People are attracted to strong brands because they represent something that they care about. We are not a chameleon and our voice should be consistent. If your brand is like an academic professor, intelligent and logical, you should never use a voice that is flip or full of slang, like a hipster. It would be off brand. But the tone can change. Because we are human, we have mood swings. Sometimes we are happy. Sometimes somber. We talk to others with different moods based on the topic or situation. Hopefully this distinction explains why you shouldn’t use the term “tone of voice” incorrectly. It doesn’t mean the whole brand personality. That’s the voice. We describe the voice with terms that describe a person. Like professional, smart, and environmentally conscious. If we are really talking about the tone of voice, we should be referencing a specific expression of the brand voice in a specific moment of time. We’re talking about just the tone. Like a headline with a tone that’s approachable. Copy with a tone that’s caring and understanding. While it sounds like I’m on a soapbox, this distinction is the linchpin for finding common ground. A brand can have a consistent voice but still express different tones based on the situation. There can be times when the brand voice is emotional and engaging, and times when the brand voice is direct and to the point. We don’t have to battle over it, we just need to know the appropriate time to express the various moments of tone. Consider a traditional marketing funnel as it relates to messaging, not media or other factors. At the top of the funnel, you have messages that are intended to engage with the audience. As you travel down the funnel, you introduce deeper information about the product until you reach the moment of a sale. In marketing, we can’t give all messages equal importance in a brand experience. You need to prioritize them. Start with a key message that will resonate. Then add in more points as the customer continues to engage with you. This is the basic truth of any good messaging brief. At some point, I realized that this same pattern of messaging can be used with the brand tone. Just as different messages are appropriate at different moments along a customer journey, the brand tone is no different. On top of that, when you overlay major lessons learned in neuromarketing, you get a similar pattern — such as the fact that our fast, emotional systems engage with brand experiences first and our slow, logical systems kick in later. Mixing these three truths of marketing, I discovered that common ground. I call it the tone hierarchy, and it can help guide the tone you use for a variety of marketing situations. There are times when a more emotional and creative message is critical. But there is also a time and a place for a more logical and direct message. The result is that both sides win. We don’t have to fight over having the entire message being direct or the entire message being creative. It’s just a question of knowing the right moment to use the right tone. In this tone hierarchy, we have five levels of messaging. Level one is the first priority of any piece of marketing material. This is the first message our audience reads. It could be a headline, a subhead, a subject line, whatever is designed to be read first. Think of this as the top of the funnel (this chart is like a funnel on its side, top of funnel on the left, bottom at the right). At level one, the tone should be more emotional, engaging, and thought provoking. We are trying to take advantage of that fast emotion in our subconscious brain. We need emotions to get the brain to fire up and we want the audience to quickly engage with us. As you get deeper into the messaging experience, into a level two or three, you begin to balance the tone between emotional ideas and logical ideas. The emotion is still present in the experience, but so are more directional and logical thoughts. The balance helps maximize the need for both engagement and product information. For example, at a level three, typical in the main body copy of an email or web page, the tone is more conversational, with more concrete details of the story or product benefits. As you progress to the right of the funnel, the tone of the message continues to change. At a level 4 message, the tone is more technical and straightforward. Here, the messaging includes elements such as bullet points, deeper product features, or technical capabilities. At this point in the customer journey, the message shouldn’t be super creative and emotional. We already have the audience’s attention. The brain is already lit up from the messaging in higher levels. Instead, this is our chance to communicate all those important facts that seal the deal. And when you finally reach level five, or the bottom of the funnel, you’re ready for a call to action. A call to action should be short and straightforward. No more emotional crap. We want to be very clear about what action we want our audience to take. This type of messaging is logical and direct. All five levels aren’t required for every ad or experience. With a billboard, you may only have time and space for level one and level five. With a web page, you may use all five levels. Simply match the levels of tone to the medium. The right tone for every step. To be fair, funnels are outdated. We know that customers today don’t follow a linear path. But the principles still apply. Every step of the journey requires a decision. Customers can either choose to accept one aspect of your marketing message and move closer to becoming a brand advocate, or they can decide to move back along the journey away from a purchase. At every moment of the customer journey, we are using a balance of both logic and emotion. It’s easy to move back and forth on different steps, so we need data and logic to give enough meat to the decision making process. And we need the emotion as validation at every step to encourage the right decision. When I compare this to the tone hierarchy, I think of the five levels as a mini checklist for each step. With every experience, we have to use the various messaging levels to maintain the relationship. Take an individual email for example. To quickly get them engaged, we need a level one tone in the headline that is creative and emotional. We also need some concrete data at some point in the experience to keep it sticky. But if you look at the example of an entire website, the whole experience is a step along the journey. The main pages should have more emotion and the deeper product pages should have more data and logic. At the same time, each individual page may use all tone levels as you progress through the experience. We don’t have an emotional headline for the main homepage and then ignore emotion throughout the website. Users can get bored and click away at any moment. Each page should be treated as an individual experience or step with the appropriate levels of tone. It’s a big balance across the whole experience where we need to use the right emotion and logic, or the right tone, to create a balanced experience every step of the journey. This hierarchy may seem simple, but for many it has helped bridge the gap between creative and logical messages. Teams no longer have to fight about tone in an email or banner ad. We all know that the headline or top level is going to be emotional and creative. Otherwise it won’t drive engagement. But the call to action shouldn’t be a creative exercise. The CTA should be bold and direct. For many left brainers, this hierarchy gives a logical structure to how we create marketing materials. They know that the facts aren’t going to be ignored, they just have a time and a place. For the right brainers, it defines a clear sandbox where they can play with emotion without constant fear of ideas being killed. 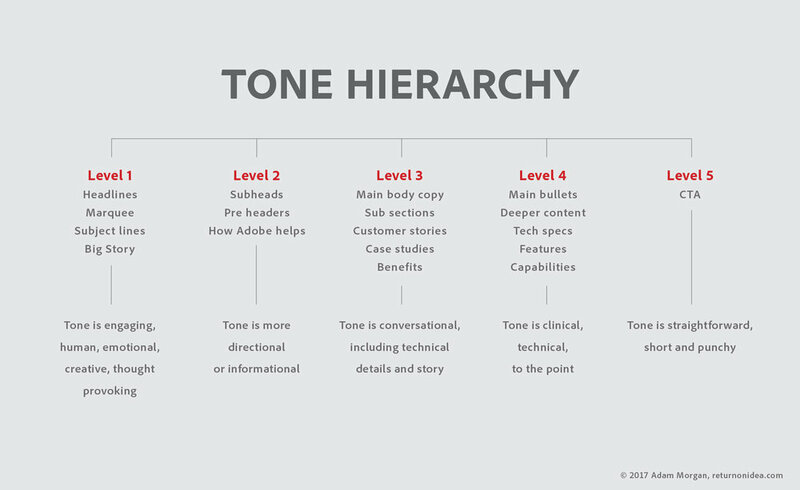 Of course, you should create a custom tone hierarchy for your brand. You may have a brand voice that is more logical all the time, so your levels of emotion and logic may adjust. Or your brand voice is more playful or lives on the cutting edge. Then you may want more emotional tone throughout the experience. By using our knowledge of brain science and how that affects the customer journey, this hierarchy helps us know the right moments to express the right tone in order to accomplish our marketing goals. After that heated conversation with Jason, we were able to work out when and where the message should be direct and when it should appeal to our emotions. Even an IT director still uses the same process to make a decision. Their brains aren’t unique. We no longer fight for one style or the other. With a better understanding of the brand tone, he realized we can use both approaches. We just need to match the right tone to the right message—while maintaining a consistent brand voice. The brand voice never changes. But sometimes you have to be direct and logical. And sometimes you need a strong emotional idea. With the right tone structure, you can have both.